Aberdeen can see off Celtic's challenge to win the Premiership title this season, according to former Dons defender Neale Cooper. The Dons are four points behind leaders Celtic with 10 league games remaining. Cooper said Celtic lacked "fight, passion and desire" when Aberdeen beat Ronny Deila's side at Pittodrie earlier this season. "It [the title] is there for Aberdeen to do," Cooper said on BBC Scotland's Sportsound. "I honestly believe that." Aberdeen capitalised on Celtic dropping two points at home to Dundee by claiming victory at Tannadice to narrow the gap at the top of the table. "It [the title] is there for Aberdeen to do"
And Cooper believes his former club have the chance to win their first title since 1984/85. "I said when Aberdeen the last game against Celtic and Simon Church scored the winner: that night I saw a Celtic team I hadn't seen in years," he said. "I thought they lacked fight, passion and desire - which all Celtic teams have shown in the past. "I know Aberdeen have had a few draws when Celtic drew and then Aberdeen fell back because they drew as well. 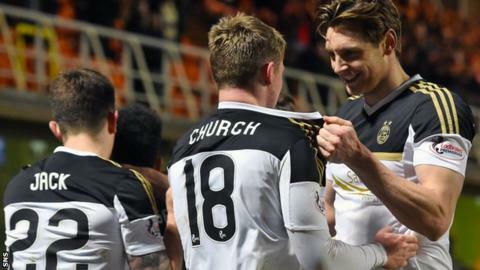 "But it [the win against Dundee United] was a massive result for them. "It's very tough to finally get it done. The last time we won the league in 1984/85 when I was playing, we didn't beat Celtic in two games at Parkhead. "That's quite hard to believe and then go on and win the title that season. I think there's a great confidence at Aberdeen. "It's put more pressure on Celtic but I feel Celtic have missed all season a star player. It's all very well putting pressure on Leigh Griffiths and he'll score goals - but not just him alone. "I don't really see anyone else who's really star quality in that side." Cooper hailed the progress the Dons have made under Derek McInnes, a manager he believes is proving to be the best at Pittodrie since Sir Alex Ferguson. "He's brought a buzz about the town," said Cooper. "Okay, being out of both cup competitions was a blow. Now they're totally focused on the league. The fans are totally behind him and the city is really supporting Aberdeen in a massive way."